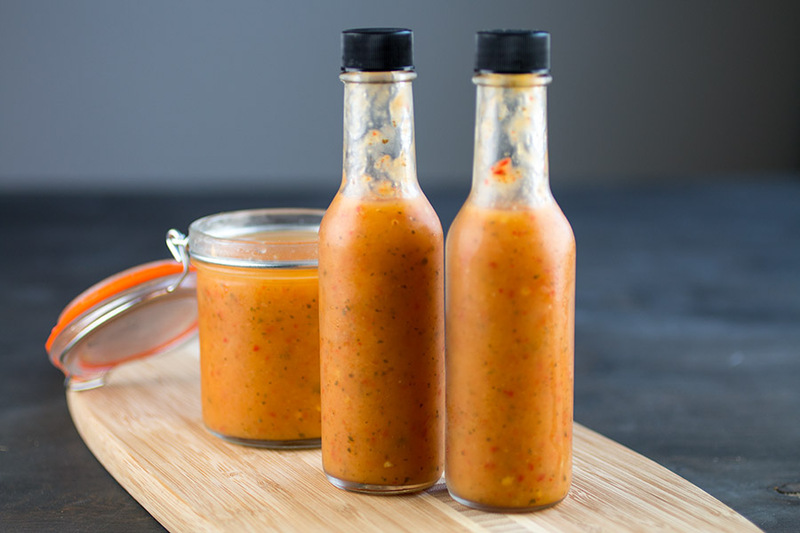 A sweet and spicy hot sauce recipe made with fiery ghost peppers, fresh mango, citrusy pineapple and more, perfect for chicken or fish. Flat out – I can’t keep these around the house long enough. They never last! Hot sauces get poured onto everything. It is AWESOME to have hot sauce around as a nice finisher. Plus, you can incorporate them into recipes. How many times have I written, “Hot Sauce of your choice” in a recipe? 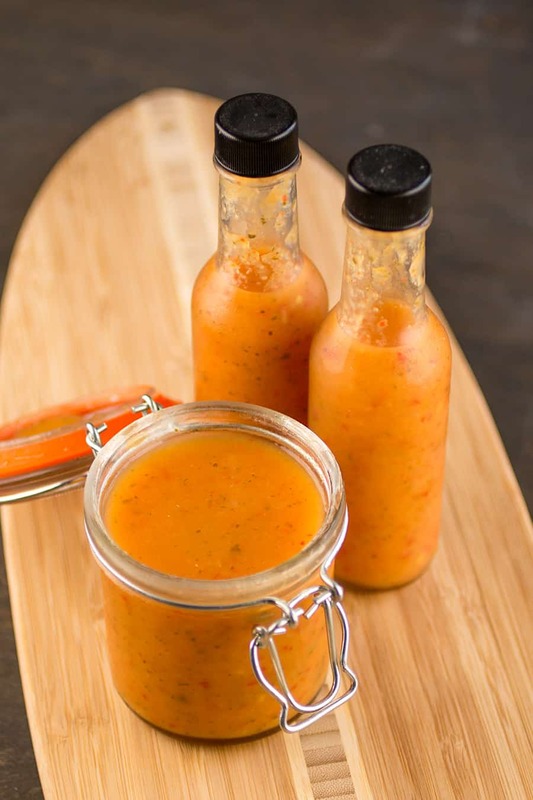 While not all hot sauces are alike, this recipe produces an ideal level of both sweet and heat, the perfect combination. Walking through the store the other day, I found this HUGE pile of pineapples and one accidentally spilled into my cart as I was passing by, so I figured, OK, fine, I will cook with you. And then his friend the mango came along for the ride. I didn’t want them to be alone, so into a sauce they went. Tropical fruit is so nice and friendly like that. Especially with ghost pepper! Yes! I know ghost peppers are hot, over 1 Million SHU, but I urge you to try this hot sauce recipe, even if you are afraid of the heat. You can always sub in some milder chili peppers, but in reality, this isn’t quite as hot as you’d think. The ghost pepper heat is tamed a bit from the sweet. This particular hot sauce is excellent on chicken, fish, or shrimp. Shrimp tacos, anyone? It would also be a nice base for a glaze. Heat a large pan to medium heat and add olive oil. Add peppers and fruit. Cook about 8 minutes to soften. Add water, vinegar, sugar, cilantro and paprika and bring to a boil. Reduce heat and simmer about 20 minutes. Remove from heat and cool. Pour into sterilized bottles and serve it up! Heat Factor: Hot. You'll get some nice heat with the ghost peppers, though the fruit does temper it a bit. I made this and it turned out great. I changed it slightly, I used only 2 ghost chilli’s. I added a small carrot, 1/2 a capsicum, more pineapple and mango. The flavour is delicious, a slow warmth but not instant heat. Going to use a few more ghost chillies next time, added with some haberneros and maybe some jalapenos. Thanks for sharing your recipes and knowledge, this is my go to site for anything chilli related. Excellent, Garry! Thanks! I love keeping it spicy. Brandon, you’d want to use more of a Louisiana style hot sauce for making a wing sauce with butter, as you are correct, it’s about the the consistency. How would I turn it into a wing sauce or do you not know? Brandon, I would strain the sauce to keep it as thin as possible and heat it to reduce some of the liquid content, so it is slightly thicker, then melt in the butter and add garlic. Simmer it until you have the consistency you prefer. Let me know how it turns out for you. Made it with a Carolina Reaper cause that’s what I had, and I didn’t even find distilled vinegar here in sweden(not googling about the acidity either) so I used regular white vinegar. Didn’t find any cherry peppers anywhere so used a similar sweet snack pepper. Also forgot to buy fresh cilantro so put some dried in there :P. These things aside from my part, damn what a good sauce 😀 Gonna try making it with the intended ingredients next time! Excellent, Joakim! Glad it turned out for you! Enjoy. If you’re afraid that the ghost pepper will be too spicy, you’re in for a pleasant surprise. I like spicy, so I added two of my largest, home grown peppers and it’s still pretty tame. Nevertheless, I love the flavors. It begs to be poured over anything. Next time I will double the ingredients. Do you recommend seeding the peppers first? Jessica, it’s your choice. I usually don’t, but removing the seeds can result in a smoother sauce. 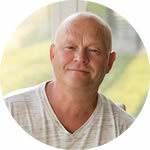 Absolutely thrilled to have found your website – I have already shared it quite a few times. Where I come from (Denmark, Europe), the hot sauces available in stores pack no heat (even those with names like death cry and edible flame) and they taste modtly like vinegar. This was the first recipe I tried, and it was great. The sweetness and proper heat without killing the taste was spot on. However, I gave a sample to my thai friend. She thanked me for the smoothie and drank the lot straight out of the jar. So, I might just increase the heat next time! That’s great, Christian. I appreciate it! The pineapple definitely tamps down the overall heat, so you can easily include more ghost peppers or hotter, or even some spicy chili powder. Enjoy! 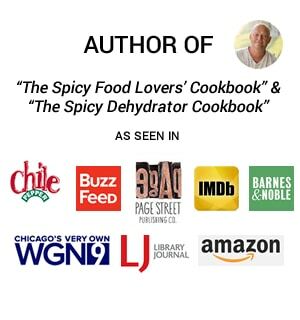 I have made several of your fermented hot sauce recipes and they are wonderful!! Robert, yes, you can ferment pineapple. No problem. I’m glad you are enjoying the recipes! Let me know how it turns out for you. Thanks, Ryan. I honestly would have never thought of chocolate milk for this! Interesting. Hi, Jake. This should make you about 2-2.5 cups of hot sauce. You can increase or decrease the amount of water to fit your desired consistency. Enjoy! Love this sauce. One of the best I’ve ever had. Keep up the great work. Thanks, Joey! I love it! I substituted the cherry peppers (hard to source in Australia) for jalapeños to add a bit more spice to all that sweetness and got rave reviews. Thanks, Lesley. Super happy it got rave reviews. Are you leaving the pepper seeds in with this recipe or removing? REPLY: Mike, I usually don’t remove the seeds, but you can if you’d like. — Mike from Chili Pepper Madness. Hi Mike. I’m not sure where your located but have you ever eaten at ‘Continental Divide’ in either Charlottesville or Richmond? They have a wait-a-minute sauce that is amazing, I’ve even tried to get the recipe but they don’t want to spill their secrets! This sauce reminds me of it and was wondering if it’s based on their sauce!? REPLY: Katie, I have been through that area but never encountered that sauce. Now you have me curious! — Mike from Chili Pepper Madness. Loved the sauce and plan to make more. Would it be possible to can this recipe so that it stores longer? If so, how do I go about doing so? REPLY: Ashley, yes, you can “can” this recipe. You would just need to make sure you follow proper procedures. See our “Preserving” section for information on this. — Mike from Chili Pepper Madness. Hi. This will be my first time making a hot sauce and I am unable to find cherry peppers. Is there something else I could use to replace them? REPLY: Ashley, look for anything red and sweet with a thicker flesh at your local grocer, such as Italian sweet. You only need a 1/4-1/2 cup chopped or so. Or, just use all ghost peppers for extra heat! — Mike from Chili Pepper Madness. Great recipe! I have a bumper crop of ghosts this year and living in Florida, a steady supply of fresh mangoes and pineapples. I made my first batch last night and used today on freshly caught grilled mahi topped with my homemade mango salsa… pure delight…Thanks for the recipe…. REPLY: That’s GREAT, Scott. Glad they were a hit! — Mike from Chili Pepper Madness. I am going to be making this in the next week! One question- once sealed initially after being poured into the bottle , does it have to immediately go to the refrigerator? I would like to give some as gifts to my fellow foodie friends, and was wondering if the room temp would cause it to go bad. Reply: Jessica, no, you can keep them out a bit, but they are better stored in the fridge for longer term use. — Mike from Chili Pepper Madness. 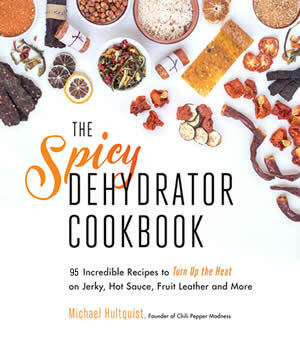 REPLY: Nick, I used fresh, though can rehydrate dried peppers for this. — Mike from Chili Pepper Madness. How much sauce does this make in ounces? REPLY: Billy, this should make close to 20 ounces or so. — Mike from Chili Pepper Madness. First time making a hot sauce. I added extra everything and used one Naga Morich (wanted to take out some of the bite of the superior pepper). It tastes great and has a wonderful kick, even family who don’t like spicy flavors are enjoying it. However, after continually pureeing it isn’t really smooth. Almost between a chili sauce and a hot sauce. Any advice to help thin it out without changing the flavor too much or should I try a different processor? REPLY: Hey, Peter – Try a food mill or straining it with a strainer or cheese cloth. It will take out the solids and make a smoother sauce. Let me know how it turns out. — Mike from Chili Pepper Madness. I tried this recipe with Orange Habaneros – which have a great flavour. This sauce is very, very fruity, I found it almost too fruity. At first I wasn’t too sure about it and found the cilantro a little over powering but having let the sauce sit in the fridge over night, it’s grown on me a lot. It was great with rice and beans and gave a lovely fruity burst and with fried fish, it was actually really good. For my next batch I’m going to try it, without the cilantro and pineapple and with the addition of half a fried onion, to give it a little more of a savoury edge – it’s a great base for experimenting and has really inspired me to try new, fruity flavours! REPLY: No problem, Mike. I’m glad it came together for you! — Mike from Chili Pepper Madness. I tried this recipe with Orange Habaneros – I can’t believe I’m saying this but I think it’s the first hot sauce recipe that I don’t really like. I didn’t love the pineapple and actually quite disliked the addition of cilantro. 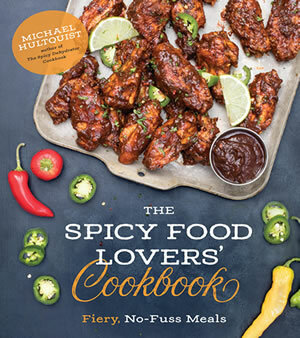 Having said that, it really inspired me to try new things with my hot sauce recipes, which is no bad thing! REPLY: Sorry you didn’t like it, Mike, but I agree, the great thing is learning to experiment and getting creative with your flavors. Learn the process and you can make any sauce you’d like. — Mike from Chili Pepper Madness. REPLY: Craig, if there is enough vinegar it will keep a long time, but I still like to keep mine in the fridge for keeping. — Mike from Chili Pepper Madness. Great recipe. I improvised as I had ripe Ontario peaches on hand. I used 2cups of diced peaches and substituted 6 cherry tomatoes in lieu of the cherry peppers. Turned out great. Can wait to try out the original recipe. Thanks for sharing this recipe. That’s great, Bob. I love that it’s such a versatile recipe. Easily adaptable! This is a great, versatile recipe. I’ve used a variety of peppers to make this sauce…..habs, ghost peppers, chocolate scorps and Jays peach ghost scorpians. My opinion, the chocolate scorps make the best. I like the earthy, mushroom flavor that they add to it. Always tasty no matter which pepper you use though. And I always double it as it never lasts long around “mi casa”. That’s great, Thomas. I love to hear this. How About using one Trinidad chocolate scorpion pepper? Would that turn out good? REPLY: Matthew, yes, absolutely. You’ll probably enjoy that awesome Scorpion Sting! — Mike from Chili Pepper Madness. REPLY: David, yes, if you follow proper canning/bottling procedures, you’d be totally fine. — Mike from Chili Pepper Madness. How long does it last?? 2 weeks?? REPLY: This should last about a month in the fridge. — Mike from Chili Pepper Madness. This recipe rocks! So easy and delicious! My local Latino Market only had Jalapenos and Manzano peppers (Apple Chilis) the day I made this, so I did 2 Manzano and 1 Jalapeno and it was great. Still had quite the kick! I will totally make this again. I had to freeze some of the leftovers, hoping they thaw OK. I’ll be adding your recipe to my blog- Thanks! Could I substitute the ghost pepper for a few habarneros? REPLY: Nicolas, absolutely. Habaneros would be great for this. — Mike from Chili Pepper Madness. Nicolas, absolutely. Habaneros would be great for this. Mike, Yes, you can easily store this in the fridge a few weeks. The vinegar acts as a preservative. I always double this recipe, as everybody keeps asking me to make more! And, the “cherry peppers” I found were in a jar, packed in water/sugar/vinegar. Though, they looked to be peppadews available at a good market. The first time, I used a jar of pimentos, which are basically chopped upcherry peppers. They are all good. I always double this recipe, as everybody keeps asking me to make more! Sounds fabulous … I’m thinking of making it for hostess gifts. How much sauce does this recipe make? Does it double well? REPLY: Joanne, yes, you can easily double this recipe. It should make you a couple bottles. – Mike from Chili Pepper Madness. Joanne, yes, you can easily double this recipe. It should make you a couple bottles. What type of cherry peppers are y p I referring too? Hot or sweet? REPLY: Mine were fairly mild, though either will do. – Mike from Chili Pepper Madness. Rhonda, yes, this can be preserved by canning. Just be sure to follow proper canning procedures. Thanks for sharing! I made this — it is so easy to make and delicious on anything you decide to grill as well. It is just the perfect portion that you will finish for summer and then make some more. I placed it on anything anyone liked to add zing to. It was a great recipe and one can add oregano or basil to it for a Mediterranean flavor. Once I added finely chopped walnuts for a “crunchy” palate.